Whether you are a lightworker, old soul, crystal child, starseed, earth angel or just consider yourself a highly sensitive person/empath, you will need to learn some basic psychic protection. The methods I share below have been tried and tested by yours truly and many of them are so ancient that nobody knows the source, only that they work. Some are witchy, some are shamanic and some are new age… Try for yourself to see which ones work the best for you for different scenarios. Besides using the suggested tools and techniques below, it is also wonderful if you begin embracing your sensitivity as the gift it is to the world. Only people as sensitive as you are equipped to do certain types of healing and psychic work. Celebrate being different to the norm and learn to ground your energy through breathing and nourishing your physical body properly. Sensitive people often walk around with their energy floating above their body. Lack of grounding can cause accidents that are not dependent on negative outside energetic input. Your guardian angel has your back but may struggle if you start stumbling down the stairs because you’re not actually in your body. Remember: There is no need to live in fear. Ultimately, nothing can destroy your spirit. 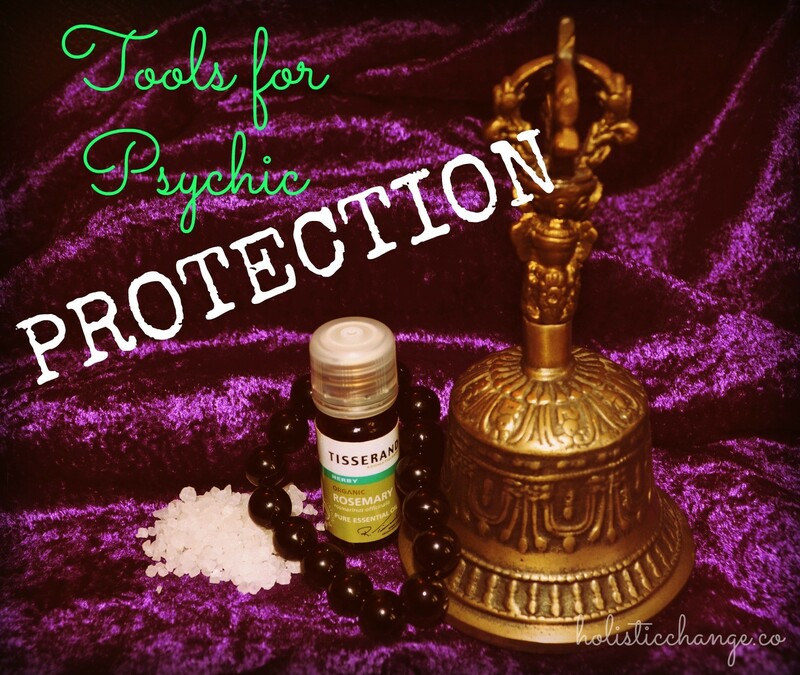 These psychic protection tools and techniques are here to make everyday life on earth run more smoothly so that you can serve more effectively. * The Bell – Always keep a bell with a nice clear ring tone at hand. I like my Tibetan prayer bell for clearing negative energy. Use it to clear energy stuck in the corners of a room with dense / negative energy. * White Sage – For smudging / clearing negative energy from your aura, home and psychic tools but also for creating a layer of protection before going somewhere you know will be energetically challenging. * Being Tidy – Sometimes being tidy with the intent of also clearing the space energetically is your best tool for keeping the vibration of your home high and clear. This goes for personal hygiene too. You can use a bath or shower with the intent to flush away negative energy that others have left in your aura. Witches like to keep a special broom (aka besom) for space clearing but using your regular brush and pan works just as well if you set the intent. * Salt – Use sea or rock salt for clearing and protecting your home or ritual space. Mix the salt with spring water or filtered tap water and sprinkle it around the boundaries of the space you wish to clear / protect. To keep your home protected, you can sprinkle some salt over your door step and also a little bit in the corners of each room of the house. Do this as a last step after you have cleaned and smudged the space. * The Auric Egg – Learn to sense the energetic boundaries of your own aura and add an extra protective layer. The electric blue of Archangel Michael is usually recommended but feel free to use the colour you intuitively feel would work best for you. To stay safe and protected while you do psychic readings or magickal workings, you may find that purple or black work better. Around negative people, the pale pink of unconditional love works wonders in filtering any energy that isn’t entirely loving out. For public speaking, surround yourself with gold and when doing soul midwifery (watching over someone who is dying), use white. * Black obsidian – This is one of the most powerful crystals to work with for psychic protection as it brings hidden influences to light and helps you face them head on. Try it but if it is too strong you may prefer smokey quartz. Both will need cleansing under running water regularly as they actively absorb negative energy. Smokey quartz is better to use for periods of grieving that may leave you vulnerable and black obsidian when you are involved in outright psychic warfare.